Nick and I went out for some lunchtime Bloody Marys this weekend and I decided to pop this poppy print number on. I often save things for best, this dress included. But today is the best! We are here and alive, that is a good enough reason to celebrate right? I figured we might as well light the expensive candles and drink the special wine too. My dress is the ASOS Midi Dress in Poppy Print with Full Skirt My heart shaped clutch bag belonged to my sister several years ago and I kind of pinched/claimed it (if you are reading this, sorry sis but you never seemed to wear it). I love having sisters! I have a huge collection of vintage silk scarves that take over a whole drawer in my dresser. I am currently in an #operationorganisation mood and am de-cluttering my wardrobe for the new year ahead. I don’t want to throw any of my scarves away as lots of them belonged to my Grandma and I have fond memories of dressing up in them as a little girl. I made a scarf hanger which is perfect as it only takes up the same amount of room as a jacket in your wardrobe. All you need is a coat hanger with a bar across the bottom and a set of shower curtain hooks which are super cheap. You can pick some up here. I have been lucky enough to have some extra time off work after the Christmas holidays. So, while everyone else is focusing on #NewYearNewYou I am being pretty naughty and continuing the indulgence! My friend Kate is visiting from London and we went for tea and cake at Sugar Junction in the Northern Quarter. Kate and I have known each other since we were 17 and we took a good half an hour to place our order because we had so much catching up to do, I have not laughed so much in a long time! We finally ordered scones which were served warm with clotted cream and jam. It was delicious. I had Pucker Up Lover tea, a blend of hibiscus flowers, rosehip, strawberry, apple, rose petals, elderberries and orange blossom – it is my favourite. If you are visiting Sugar Junction (and I recommend that you do) I suggest avoiding lunch times at the weekend as it gets super busy. The afternoon tea is also amazing. It was such a lovely lunch date, we both left with tummy ache from laughing so much. Thanks to social media the possibilities of the online world are limitless. Your idols are just a tweet away. I love meeting and reading about bloggers who have harnessed these opportunities and created profitable online businesses through digital innovation. Here are three of my favourite blogs that are totally different with one common theme: the authors are seriously talented business women. What is special about the blog? :This lifestyle blog is packed with do-it-yourself interior design projects and colourful fashion posts. You could get lost in the archives for hours, or maybe even days! 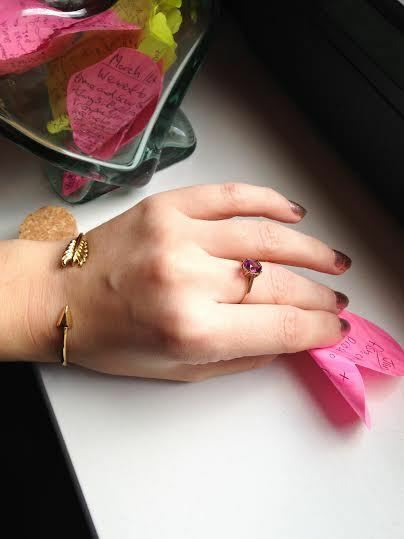 The colourful world of A Beautiful Mess (ABM) inspired me to write my own blog. ABM was started over nine years ago by two sisters, throughout the years the blog has grown from a hobby into a multimillion dollar business. It is really interesting to search back through the archives and see how their blogging style (and indeed their own lifestyles) have changed through the process. How does the blog generate income? : Where to start?! The blog is read by 1.4 million unique visitors each month. This is like gold dust for companies wanting to advertise their products and engage with the readers of ABM. These impressive stats have attracted huge sponsors including Cannon, Adobe and H&M. The most successful venture so far is #1 selling app, A Beautiful Mess. With the app you can add doodles, notes and filters to your photographs inspired by the style of Elsie and Emma’s Instagram posts. The most recent venture is an online store which sells stationary and craft supplies selected by the team from a wholesale company that handles the distribution and orders. This cuts out the overheads of stores and packaging. These guys really know how to work their social media channels and have developed a particularly captive audience on Instagram. Check out the hashtag #abeautifulmess to find out more. What is special about this blog? : The Londoner looks like a character from Made in Chelsea and has the lifestyle to match. The blog content is aspirational and high end. The hard work and clever marketing that has gone into this blog is effortlessly disguised as a rich girl’s hobby. How does this blog generate income? : Luxury brands and VIP members only clubs regularly feature in the sponsored posts. There is a shop section which lists handpicked products from various retailers generating commission which cuts out overheads. The blog features third party adverts in the sidebar and header. What makes this blog stand out? : In The Frow AKA Victoria is a beauty blogger with lavender hair and a PHD in Mobile Fashion Apps #wow! Victoria was a Fashion Retail Lecturer at Manchester University putting her teachings into practice. On New Years Day she announced that she was taking the leap and becoming a full time blogger. Victoria prides herself on integrity and values the trust of her readers. Sponsored posts are consistent with the ethos of the blog and she has clear ground rules in the press section of the blog: ‘I will never be paid or incentivised to speak positively of a product if I do not agree’. How does the blog generate income? : Victoria is resourceful in her business approach, for example she collaborates with talented student photographers and makeup artists. This is a good opportunity for fresh talent to gain exposure/grow a portfolio whilst saving on photographers costs. The blog has a shop selling clothing and products which have featured on the site. In some cases the products have been gifted to the author meaning the only investment is listing & packing time plus postage costs. The blog contains adverts and features regular sponsored posts for large companies. If you like this post then you might also like ‘Dior Baby’ featuring In The Frow and other bloggers. My camera is also new but I will tell you all about that soon! 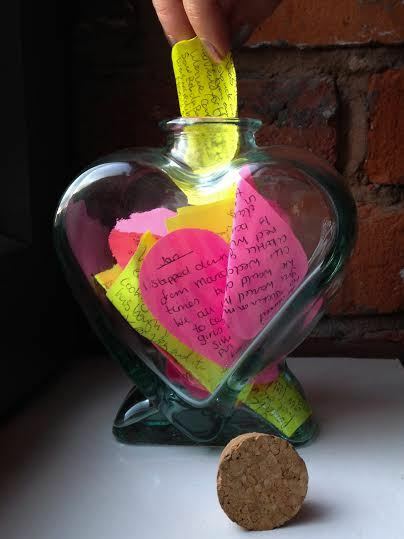 A few years back I made a New Years resolution to bottle my memories in a gratitude jar. It has since become a tradition and I wanted to share it with you. Start the year with an empty jar and each time you experience something that makes you feel grateful or happy make a note of it on a little slip of paper and store it in your jar. The memories that you keep can be absolutely anything. Mine always vary so much. It might be something as simple as doing yoga for the first time and feeling radiant or something more poignant like recovering from an illness. Sometimes I am surprised to find that my friends and family have added their own notes into my gratitude jar too. On New Years Day Nick and I sit down together and go through the jar, each taking it in turns to read out a memory. Storing your memories in this way really puts the year into perspective and makes you realise how much you have achieved, each note is like a little treasure. I suggest sticking each years worth of notes into a scrap book so that one day you can look back on your fondest moments from the past decade or so and see how far you have come. Happy New Year everyone! May your gratitude jars be full of happy memories! © 2016 Led By Lucy. All Rights Reserved. Disclaimer.